Light, bright and design-led, MOMO in Amsterdam is a great destination with delicious cocktails and casual and more formal dining available. Located right in the heart of Amsterdam, the Park Hotel is the epitome of the chic urban hotel. It’s a light, bright, design-led, contemporary space that exudes style on every level. 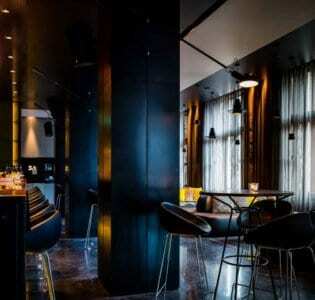 In no place is this truer than in MOMO, the Park’s restaurant and lounge bar. It’s a fashionable spot, and a destination in its own right, replete with shining wood floors, its mirror-adorned walls offset by splashes of bold colour. There’s a cool, curving bar area and space for more formal dining. Both the menu and the drinks reflect an East meets West ethos: try their Thai Daiquiri, spiked with Thai basil, or their Asian Raspberry, a heady blend of plum wine and raspberry liqueur.